EJ Hill, born in Los Angeles in 1985 and now based in both New York and Los Angeles, earned an MFA from the University of California, Los Angeles (2013) and a BFA from Columbia College, Chicago (2011). Venues for his recent exhibitions include The Studio Museum in Harlem (2016), PIASA, Paris (2015), EFA Project Space, New York (2015), and Commonwealth & Council, Los Angeles (2014). 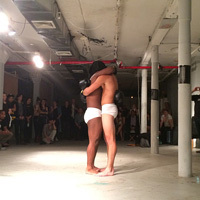 Hill has performed at Grace Exhibition Space, Brooklyn; LAXART, Los Angeles; Chicago Cultural Center; and Cave, Detroit, among many others. Hill was an Artist-in-Residence at The Studio Museum in Harlem, New York and the recipient of the Fellowship for Visual Artists from the California Community Foundation. He is short-listed for the 2017 Future Generation Art Prize, an honor given by the Victor Pinchuk Foundation in Kiev. Hill's diverse body of work is grounded in performance -- often powerful, physical, durational experiences that, in the words of the artist, "create spaces for those of us who live in bodies relegated to the margins -- spaces that demonstrate the power of possibility, spaces that allow us to collectively imagine and work toward more fruitful futures." 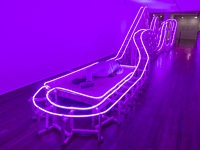 In A Monumental Offering of Potential Energy (2016), Hill laid motionless on a platform at the end of a glowing neon rollercoaster, a performance that lasted for the entirety of the exhibition, a total of 521 hours. Lemonade (2015) took the form of a neighborhood lemonade stand, providing free refreshments adjacent to a platform that gave viewers free space to "struggle in public." The Fence Mechanisms (2014) was a 2 1/2 hour performance in which Hill jumped rope, one end tethered to a chain-link fence bisecting the gallery, until the point of collapse. By finding, and sometimes exceeding the limits of his body, Hill creates moments that forge deep empathy, reconfiguring perceptions and, ultimately, relationships. The 2016 jury included Erin Christovale, Curator of the Los Angeles Municipal Art Gallery and co-founder of Black Radical Imagination; Sohrab Mohebbi, Associate Curator at the Roy E. Disney Cal Arts Theater (REDCAT), Los Angeles; Diana Thater, artist; and Mario Ybarra Jr., artist.